Rejecting the plea of an accused facing trial to produce certain pages of police diary obtained by him through RTI for the purpose of contradicting the police officer, the Supreme Court in Balakram vs. State of Uttarakhand, reiterated that the accused cannot claim unfettered right to inspect the case diary. The Supreme Court rejected a plea to incorporate detailed life history and teachings of all 10 Sikh Gurus along with Guru Granth Sahib in syllabus of all classes in history books for teaching. In a major verdict, the Supreme Court on Monday ordered the Kerala government to restore the services of ousted DGP T P Senkumar holding that his removal was arbitrary and not as per established law. In a major victory for the Tax department, the Supreme Court upheld a Delhi High Court ruling, which had held that Formula One World Championship (FOWC) had a permanent establishment (PE) in India and, therefore, the income accrued will be taxable in India. The Supreme Court ON Thursday set aside conviction of accused of murdering a Hindu Munnani Activist in Madurai. The Bench comprising Justice Pinaki Chandra Ghose and Justice RF Nariman held that the sanction order was illegal and hence the criminal proceedings for prosecution under the TADA Act are vitiated entirely and that TADA court grossly erred in taking cognizance of the case. The Supreme Court, in Brijendra Singh vs State of Rajasthan, observed that the degree of satisfaction to exercise power under Section 319 CrPC to summon persons not arraigned as accused is more than the degree warranted at the time of framing of the charges against others in respect of whom charge sheet was filed. The Supreme Court, in Heera Lal vs State of Rajasthan, held that in a case of suicide of wife, acquittal of the relatives or husband under Section 498A IPC will bar prosecution to use presumption available under Section 113A of the Evidence Act prove abetment to suicide under Section 306IPC. The Supreme Court, in Kinnari Mullick vs. Ghanshyam Das Damani, held that Section 34 (4) of the Arbitration and Conciliation Act 1996, does not empower the court to relegate the parties before the Arbitral Tribunal after having set aside the arbitral award in question. The Supreme Court, in M/s Mangalam Organics Ltd vs Union of India, held that a writ of mandamus cannot be issued to the Central Government directing it to issue a notification under Section 11C of the Central Excise Act, 1944, to the effect that duty payable by the manufacturer on goods manufactured by it shall not be paid. The Supreme Court in Gohil Vishvaraj Hanubhai vs. State of Gujarat, upheld a Gujarat High Court judgment which had approved the state decision to conduct fresh examination to the post of Revenue Talati, allowing all those who participated in the earlier examinations irrespective of their involvement in malpractice, to take part in re-examination. Supreme Court of India on Friday observed that a woman has her own space as a man has in our society. A three Judge Bench of Justices Dipak Misra, A.M. Khanwilkar and Mohan M. Shantanagoudar was considering an appeal filed by Accused against his conviction for abetment to suicide of a girl because of his continuous harassment and eve teasing. Dismissing the challenge against constitutionality of certain provisions of the Lokpal and Lokayuktas Act, the Supreme Court held that the Constitution does not mandate that in all matters concerning the appointment to various offices in different bodies, primacy must be accorded to the opinion of the Chief Justice or his nominee. When the seriousness of the offence is such, the mere fact that he was in jail for however long time should not be the concern of the Courts, the Supreme Court said, while holding that bail cannot be granted on the sole ground that accused was in custody for a long time. The Supreme Court on Monday issued notice to the Centre and Army on a petition filed by a journalist booked under Official Secrets Act (OSA) by Nashik police in connection with the suicide of Lance Naik Roy Mathew who figures in her sting video related to the controversial sahayak(buddy) system in the Army. The Supreme Court directed a husband to provide his wife Rs. 50 lakh amount and a flat worth Rs. 1 crore, even though it held that the acts of the wife in filing false complaints against the husband amounted to cruelty. The Supreme Court on Wednesday ordered handing over of the probe report submitted by former judge Justice S B Sinha on the 2006 Meerut fire which claimed 60 lives, which fixed responsibilities and liabilities on the state government and the organizers, to the Uttar Pradesh government for it to take a stand on disbursement of compensation. The Supreme Court struck down Section 3(6a) of the Himachal Pradesh Private Medical Educational Institutions (Regulation of Admission and Fixation of Fee) Act 2006, as unconstitutional and held that the private unaided college under Maharishi Markandeshwar University cannot be insisted to get affiliation from Himachal Pradesh University. After exhausting every legal option to undo the Supreme Court’s ruling in the Manipur killings case, the government now has to mandatorily probe every allegation of an extra-judicial killing. 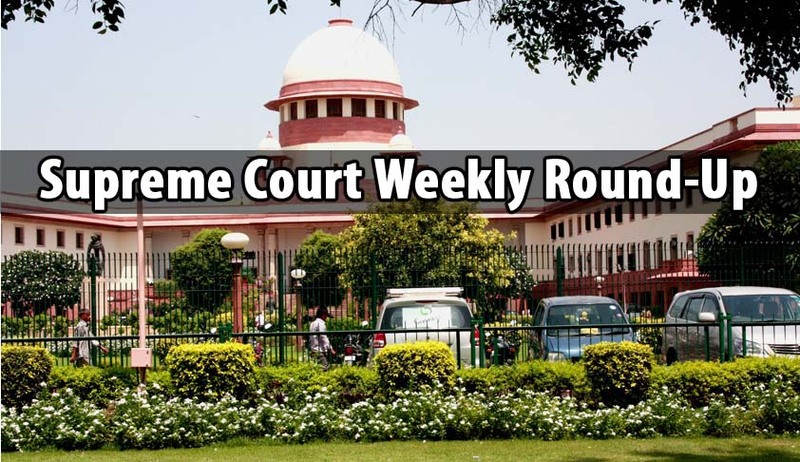 On Thursday, the apex court dismissed a curative writ petition filed by Union of India and declined its plea for an open court hearing. Strongly pushing for appointment of a Lokpal, the Supreme Court on Thursday said the existing Lokpal Act is a workable piece of legislation and there was no justification to keep its operation pending. With an observation that it is an issue of international reputation and the government has to deal with it expeditiously, the Chief Justice of India-led bench asked the Centre to speed up the process to take a decision for the enactment of anti-custodial torture law. The Supreme Court granted bail to former AMU Scholar Gulzar Ahmed Wani, an accused in the 2000 Sabarmati Express train blast case, who suffered incarceration for over 16 years. After hearing it for 23 years, the Supreme Court on Monday transferred to the National Green Tribunal a public interest litigation seeking de-polluting of river Yamuna and a complete clean up. The Supreme Courts issued notice to Centre and Tamil Nadu government on an appeal filed by an environmental activist against the National Green Tribunal’s order dismissing his plea which has challenged the clearance given to four units under the Kudankulam Nuclear Power Project. Observing that filling up of the vacancies over 1.5 lakh in the police force would help in dealing with the law and order problem in the state, the Supreme Court directed the Uttar Pradesh government to fill the posts in four years. In major direction pertaining to the implementation of Rights of Persons with Disabilities Act 2016, the Supreme Court on Tuesday directed all states and Union Territories to ‘scrupulously’ follow the new law and the rules. The Supreme Court on Wednesdsay asked the Centre to examine enacting a law to regulate government funds for NGOs and prosecute them in case of misuse, misappropriation of funds or non-filing of annual statements. The Supreme Court, in a plea by the Telangana Judges’ Association directed the Centre to prepare draft guidelines in consultation with High Court on allocation of Judges.